Korina’s smile widened as she watched steam rise from the spring, spinning delicate bronze levers in the upper reaches of her device. Below, hot water spun wheels that powered the looms. The cave was filled with the clatter of moving parts, the wondrous sound of the first automated manufactuary in all the city states of Greece, and therefore surely in the whole civilised world. A wonder to match the colossus recently raised at Rhodes. All her work. Outside, priests were shouting like a band of petulant children, as they had done since she arrived weeks before. If this spring had truly been the divine oracle they claimed, surely it would have warned them that the people of Athens, dazzled by her work, would grant it to her to power her machine. At the end of the cave, freshly woven togas were tumbling off the machine and into the donkey cart that would carry them to market. Stamatia, her assistant, was picking samples out at random to try them on. She squirmed and struggled as the toga shrank around her. Hastily, Korina unfastened the garment and set her free. “I’m sure the rest are fine,” Korina said, nudging the strangely shrivelled toga with her toe. Of course, there was no need to keep testing, these were just flukes. But out of curiosity, she picked up another toga and tried it on. No sooner had she fastened it into place than she felt a great weight bearing her down. It was as if the cloth were made of lead. She tore it off with trembling hands and donned another. When she tried to walk, she tripped over her own feet, as she had not done since she was an infant. The biggest bull Korina had ever seen lay roasting in the heart of a blazing bonfire. The smell was mouth-watering, but no human tongue would taste that flesh. It was an offering, one whose grandeur warmed her soul. Even the priests had been grudgingly impressed, though they still shouted whenever she came near. That should be more than enough to appease the gods. She strode into the cave and grabbed the next toga to come off the line. It stung like ice on her fingertips. Her skin went numb when she put it on. “That wasn’t enough?” she shouted to the heavens. Stamatia backed off, watching her with trepidation. She stormed out to the fire and flung the togas in, bellowing a prayer to all the gods as she did so. The precious clothes, proof that her machine worked, blazed into flames. She strode back inside, grabbed another armful, and burned them too. As fire consumed her creations, Korina heard a yelp from inside the cave. Stamatia ran out, flames flying from the toga in which she was wrapped, and jumped into a nearby stream. Korina’s scream was born as much frustration as alarm. Once the physician had arrived and tended to Stamatia, Korina went back into the cave. She laid a hand on the gleaming bronze of her machine. A thing of such wonder and intricacy. Years of work in design, testing, and production. Her proudest creation. She picked up a hammer and raised it, ready to strike. “Is this the only way to lift the curse?” she whispered, her voice cracking at the thought. A toga fell from the machine into the donkey cart. Korina took a moment to enjoy her achievement one last time. Such a tragedy to destroy it, but she was no priest, able to win back the favour of angry gods. She was an inventor and a businesswoman. She needed to start thinking like one. 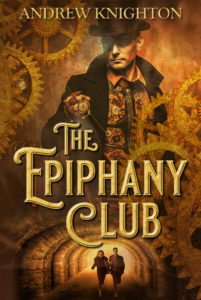 During the steampunk panel at this year’s FantasyCon, we talked about other eras we’d like to see get the treatment steampunk gives to Victorian Europe. One suggestion was ancient Greece, with its inventors and early machines. This story got a little away from the tone I imagined then, but hey, it’s a start. And if you’d like to read more experiments in short stories, why not sign up to my mailing list and get one straight to your inbox every Friday?